Reckless and egotistical billionaire (and former Starbucks CEO) Howard Schultz is thinking about running for President as an Independent. He feels like it’s unfair for bold progressives like Alexandria Ocasio Cortez and Elizabeth Warren to tax his billions, and what American politics really needs is MORE money for billionaires instead. This delusional wrecking ball of a campaign threatens to peel off just enough voters to re-elect Trump. What can we do about it? We can’t take this lying down: join the #NoHowardNo campaign to oppose him now! We’re gathering up an army of progressive activists around the country to dissuade Howard Schultz from running as an Independent. Help us show him we mean business. Howard Schultz has been touring the country shilling his books and bad philosophy, and so far he’s getting an earful from the people. But we need to step it up so he gives up, before it’s too late to stop him. We’re organizing online and offline to make sure he hears us! 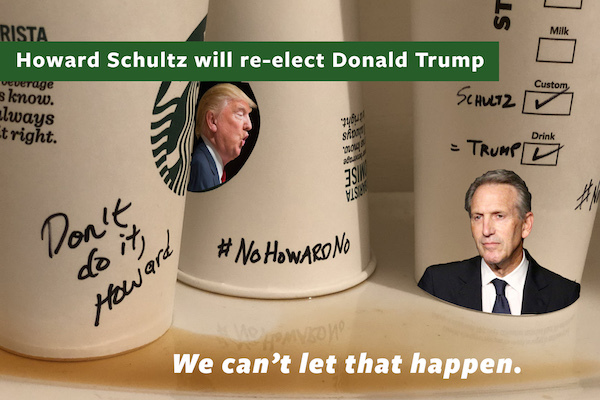 Sign up today to stop Howard Schultz and his dangerous campaign.